27/08/2013 - China signed the Multilateral Convention on Mutual Administrative Assistance in Tax Matters at a ceremony today at the OECD. All G20 countries have now fulfilled the commitment they made at the Cannes G20 Summit to sign the Convention and move towards automatic exchange of information as the new, global standard. Tax authorities worldwide are moving from bilateral to multilateral cooperation and from exchange of information on request to automatic exchange of information. The Convention provides a comprehensive multilateral framework for such co-operation and complements other initiatives, such as the standardised multilateral automatic exchange model being developed by the OECD and its G20 partners. 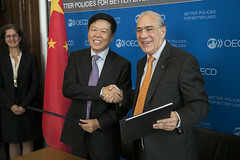 Mr. Angel Gurría, OECD Secretary General and Mr. WANG Jun, Chinese Tax Commissioner at the signing Ceremony today. The G20 has consistently supported the Convention. At their last meeting G20 Finance Ministers and Central Bank Governors stated, “We call on all countries to join the Multilateral Convention on Mutual Administrative Assistance in Tax Matters without further delay”. The OECD, China and other G20 countries are working together to develop the operational platform for the new single global standard for automatic exchange of information which has been endorsed by the G20. The 56 signatories to the Convention are: Albania, Argentina, Australia, Austria, Azerbaijan, Belgium, Belize, Brazil, Canada, Colombia, Costa Rica, China, Czech Republic, Denmark, Estonia, Finland, France, Georgia, Germany, Ghana, Greece, Guatemala, Iceland, India, Indonesia, Ireland, Italy, Japan, Korea, Latvia, Lithuania, Luxembourg, Malta, Mexico, Moldova, Morocco, Netherlands, New Zealand, Nigeria, Norway, Poland, Portugal, Romania, Russian Federation, Saudi Arabia, Singapore, Slovak Republic, Slovenia, South Africa, Spain, Sweden, Tunisia, Turkey, Ukraine, United Kingdom, and United States. To view the photos of the signing Ceremony see: http://www.flickr.com/photos/oecd/sets/72157635249699105/.